Sunomono is a simple Japanese vinegar salad often made with cucumbers. Light and refreshing, it makes an excellent snack on a warm afternoon. In this activity, you can make your own version of this Japanese staple to introduce your child to the cuisine of other cultures. 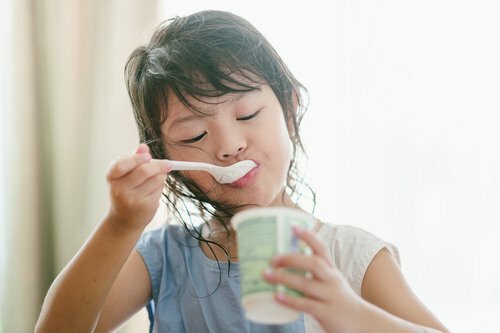 Don't worry if your child hasn't learned how to use chopsticks yet—you'll also make quick kid-friendly chopsticks that make eating with chopsticks a snap! Not only is using chopsticks fun, it's also great for improving dexterity and fine motor skills. Begin by preparing the dressing for the sunomono. Whisk together the rice vinegar, sugar, and salt in a bowl large enough to hold the sliced cucumber. 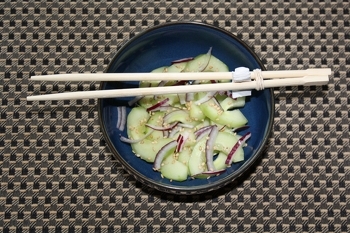 Once the dressing is mixed, add the cucumber and let marinate in the refrigerator while you make the chopsticks. 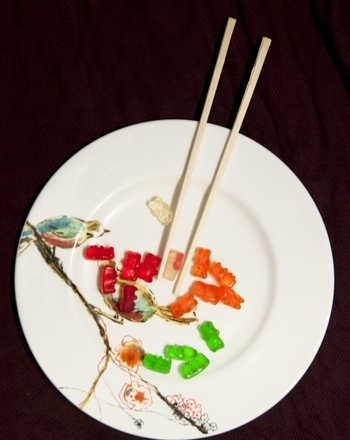 Have your child unwrap the disposable chopsticks, taking care not to tear the paper wrapper too much. Help him fold over the end of the wrapper about 1/4 inch, then fold the other way another 1/4 inch. Continue folding in an accordion pattern until the wrapper is completely folded. Have him gently separate the chopsticks. Place the folded wrapper between the two chopsticks about 2-3 inches down from the top (the thick end). Holding the wrapper in place, carefully twist the rubber band around the chopsticks just above the wrapper until tight. Now that your chopsticks are ready, it's time to finish making the sunomono! Remove the marinating cucumbers from the refrigerator and spoon into small bowls. Garnish with a few slices of red onion and a sprinkle of toasted sesame seeds. Now it's time to eat! Show him how to use the chopsticks by holding them below the wrapper and squeezing to pick up a piece of food. 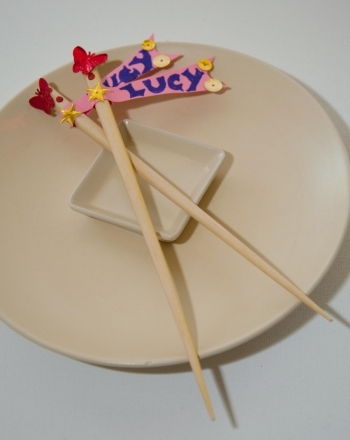 Help your child add her own silly charm to a pair of traditional chopsticks. Colour this page in conjunction with our other healthy eating coloring pages to show that every once in a while, sweets can be a fun treat. This fun-filled worksheet will help year one students practise understanding the concept of greater than or less than. Encourage healthy eating habits in your child with this fruit-themed placemat.